Group 1. For children 9 to 18 kgs. DescriptionISOFIX carseat model. Can be used with the Isofix system in car or with the car seat belts. Carefully follow provided instructions for use. Group 1 position: facing the road (from 9 up to 18 kgs). 3ème point d'ancrage "Top Tether"
Installation possible avec la ceinture de sécurité. Harnais et repose-tête ajustable sur 6 hauteurs afin de s'adapter parfaitement à la taille de l'enfant. Housse en maille douce et respirante. Suitable for children from 9 to 18 kgs (approx. 12 months up up to 4-year old). 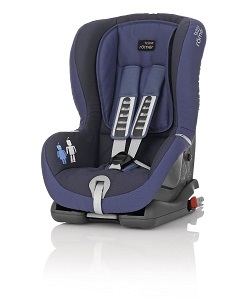 Read Britax Romer Duo Plus Isofix instructions here. See Britax Romer Duo Plus car seat installation video with Isofix here and with belts here. Color of delivered car seat may vary. Questions about delivery and collection? Read our questions-answers page here. Need to rent a car-seat for more than 1 month? Contact us for a specific quote. The Britax Romer Duo Plus Isofix car seat demonstrates all qualities to be part of our range of baby car seat rental: easy to use - with its visible, colored handles and buttons to garantee a correct installation in car- fast installation - even if you're not used to this model. Its lightweight helps moving it between cars or remove it. Your child will also enjoy its comfortable, padded seats and wings. Cover is fully removable allowing you to get a full cleaned seat when rented. "Working with Camille to rent car seats for our vacation in Paris was a simple and painless process. She was very responsive to our questions. Camille was prompt with delivery and pick up of the two items we rented. The condition of the two car seats was impeccable. They were perfect for our trip and we would recommend this service to anyone traveling in France with children."